The Coega Development Corporation (CDC) announced today that energy development from gas in South Africa is entering a ‘golden age,’ and gaining significant momentum. “Energy development from gas is especially important because it will assist the country to meet base-load energy needs between 2020 and 2030. The upside for gas to power projects is its character for relatively shorter gestation period,” said Sandisiwe Ncemane, CDC Energy Manager. The CDC issued a tender notice for an Environmental Impact Assessment (EIA) for gas to power facility. “We have received an overwhelming number of responses from local and international key industry players,” added Ncemane. The proposed facility will be conveniently situated less than 4km from the 400kV Dedisa substation, which will significantly reduce costs for taxpayers and authorities. As a key player in the industry, CDC is aware of discussions highlighting some of the challenges raised by industry captains, one of those, key challenges relate to infrastructure. The CDC has managed to provide comfort in its ability to respond to the challenge as part of its unique value proposition the IDZ has world class infrastructure. “The CDC’s case is strengthened by existing infrastructure as it reduces costs for business through its proximity to the planned processing facility that will convert LNG into gas and a 2km pipeline to the power plant that will generate electricity from natural gas,” adds Ncemane. 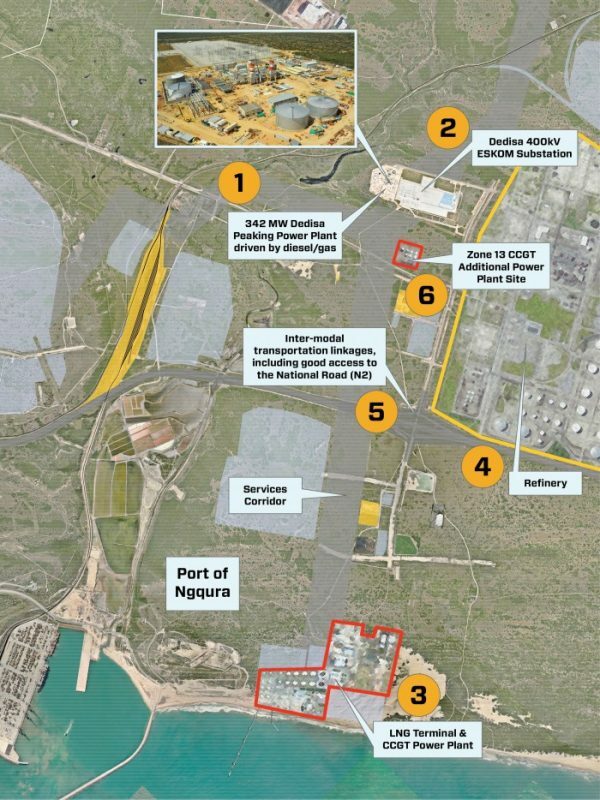 The proposed Gas-to-Power plant will be the second power plant in the Coega IDZ after the Dedisa Peaking Power Plant – R3.5 billion, liquid fuel open cycle gas turbine with a 342-megawatt (MW) generation capacity. The CDC is one of the most advanced in terms of preparations for gas to power projects and is the ideal location for the LNG berth. “One of the critical game changers for the CDC is the cost factor. The Dedisa Power Peaking Plant currently in commissioning in zone 13 of the Coega IDZ, with the existing environmental authorisation for 400kV transmission lines from project site to substation reduces the costs of the gas to power project,” added Ncemane. Another factor is that CDC, since 2006, has undertaken at least five environmental impact assessment studies supporting the gas-to-power solution. The Coega IDZ, hosts world class infrastructure through its 14 cluster zone model. The IDZ, has available land to be able to host key gas to power projects with spin offs for various other sectors. The CDC has approved the Coega Infrastructure Master Plan – defined services corridor from project site to Dedisa Substation and good access to site via the N2 national road and the ancillary road network. At a provincial level the CDC is one of the key players in the Eastern Cape (EC) in supporting efforts to diverse the EC economy through introduction of conventional and renewable energy. The strategic environmental assessment (SEA) for shale in the Karoo is a relevant development and shale gas is a key determinant in developing a LNG solution for the country. The Nelson Mandela Metropolitan University (NMMU), a critical partner in the study of knowledge and skills development will be providing input into the SEA. Comments attributed to the Premier of the Eastern Cape – Phumulo Masualle earlier in the year illustrating that ground-breaking scientific research into shale gas, mapping a detailed technical understanding of the potential shale gas resource and possible environmental risks associated with its extraction was underway. This, he added, would enable the provincial government “to plan for optimal socio-economic and environmentally responsible outcomes”. Masualle said the discovery of the shale gas reserve “offers us an opportunity to further grow our economy and to create much needed jobs for our people”.